Brown County was organized on September 17, 1855, as one of the original 33 counties created by the Territorial Legislature. Containing the cities of Everest, Fairview, Hamlin, Hiawatha, Horton, Morrill, Powhattan, Reserve, Robinson, Sabetha (part) and Willis, the county was founded by William Gentry; H. C. Gregg; Thurston Chase; James Mills; E. R. Corneilison; W. C. Foster; John Belk; and Jacob Englehart. The county was named for Albert G. Brown, U. S. Senator from Mississippi. In 1855 the settlers of Walnut Creek formed a protective association to enforce the rights of actual settlers against intruders, and to prevent the sale of liquor to the Indians; the Oregon Trail passed through the county. The first ch urch was a Methodist congregation established in a rural area in 1857. The first school was held in 1856 in a log cabin on the John Kersy farm. Interesting figures from the county are Governor Edmund N. Morrill (1895-1897), who was also a congressman (1883-1891), William P. Lambertson (1929-1945) Howard S. Miller (1953-1955) and Kansas Supreme Court Justice Samuel Kingman (1861-1865). General Bernard W. Rogers, Chief of Staff of the Army, 1976, retired from the army as Supreme Commander of NATO in 1987. For more information see the website. 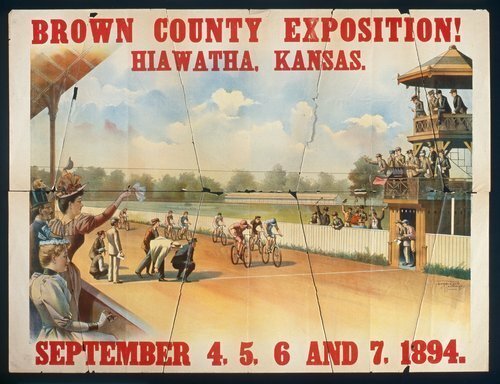 There is a Brown County Historical Society in Hiawatha. Additional information not submitted.